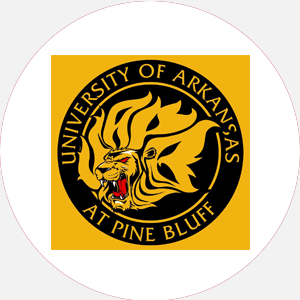 The University of Arkansas at Pine Bluff (UAPB) is a four-year, private, coed, liberal arts institut…. The University of Arkansas at Pine Bluff (UAPB) is a four-year, private, coed, liberal arts institution founded in 1875 as the Branch Normal College. The first classes were taught to 7 students in a rented frame building in Pine Bluff. In 1882, the state erected a two-story brick building on a 50-acre lot in suburban Pine Bluff. Between 1881 and 1894, ten Bachelor of Arts degrees were awarded. From 1894 to 1929, Branch Normal College operated as a junior college. In 1927, several significant changes took place: first, the governor appointed an independent board of trustees; second, the state legislature appropriated 5,000 to begin building a new campus just outside the city. Finally, funds from the General Education Board and the Rosenwald Fund, totaling 6,000, were donated to aid the project. In 1929, the school became known as Arkansas Agricultural, Mechanical and Normal College (AM&N). In 1933, Arkansas AM&N was certified to grant baccalaureate degrees. Two aggressive building programs begun between 1935 and 1940 resulted in the campus doubling in size by the late 1960s. Additions included academic and administrative buildings, student service facilities, additional living quarters for faculty members and students, and an expansion in services and research facilities at the 220-acre College Farm and Agri-Lab. On July 1, 1972, Arkansas AM&N merged into the University of Arkansas System and was renamed University of Arkansas at Pine Bluff. As a land-grant institution, UAPB is committed to providing high-quality educational programs in the agricultural sciences as well as the arts and sciences. UAPB works to recruit students who are from a variety of cultures and backgrounds. ACCREDITATION University of Arkansas at Pine Bluff is accredited by the North Central Association of Colleges and Schools to award the Bachelor of Arts, Bachelor of Science, and master’s degrees. University of Arkansas at Pine Bluff is accredited by the North Central Association of Colleges and Schools to award the Bachelor of Arts, Bachelor of Science, and master’s degrees. Percentage of students receiving financial aid: 85 Total amount of scholarships and grants: ,240,423 Financial Aid Specific to the School The Academic Challenge Scholarship Program is available to high school graduates who enroll as first-time students at the University, have completed the recommended precollegiate core curriculum, and meet criteria established by the Arkansas Department of Higher Education. Academic scholarships are awarded to students who are residents of Arkansas and have scored 21 or better on the ACT or rank in the top 10 percent of the class. The scholarships are for tuition only and are available for a maximum of eight semesters. Army ROTC scholarships provide two- and three-year scholarships that pay tuition, fees, books, and a monthly stipend. Students should contact the ROTC Office. July 1 (fall); December 15 (spring); continuous notification. Graduation from an accredited high school (or equivalent) and completion of the following 21 units: 4 English, 3 mathematics, 3 natural science, 3 social sciences, 2 foreign language, ½ oral communications, ½ physical education, ½ health and safet, ½ fine arts and 4 electives; official high school transcript; minimum C average; composite ACT score of at least 19; proof of immunization. No application fee required. A minimum of 62 semester hours for an associate degree and a minimum of 124 semester hours for a bachelor’s degree; completion of core requirements, including 6 English, 11 science, 9 social sciences, 6 humanities, and 5 physical education; satisfy English proficiency by junior year; complete comprehensive exam in major field; minimum 2.0 GPA. Campus Regulations: Mandatory two-day college orientation session for freshmen and transfers; cars must be registered. Campus Services: Health center; personal and psychological counseling; career counseling and placement; student employment services; remediation; tutoring; post office; testing service for ACT, CLEP, GRE, NTE, and GMAT; religious activities. Campus Activities: Social and cultural activities include theater, band, and chorale. Annual events include the candlelight march, concert, and other programs commemorating Dr. Martin Luther King, Jr., during the month of January. Spring Emphasis Week, the Women’s Day Convocation, and Black History Month are celebrated each year. Students may get involved in the Arkansawyer (student-run newspaper) or the Lion, an annual student publication supervised by a faculty adviser. The Lyceum Program provides concerts, art exhibits, lecturers, and dramatic presentations. The Student Union Governing Board works to create and improve the University’s social, cultural, and recreational atmosphere and serves as an advisory board to the director of the student union. Leadership opportunities can be found in the Student Government Association or the various other clubs and organizations on campus. Greek-letter sororities include Alpha Kappa Alpha, Delta Sigma Theta, Sigma Gamma Rho, and Zeta Phi Beta; fraternities include Alpha Phi Alpha, Kappa Alpha Psi, Omega Psi Phi, and Phi Beta Kappa. Honorary societies are also represented on campus. Housing Availability: 1,000 housing spaces, including a new student dorm and newly remodeled dormitories. Handicapped Services: Wheelchair accessibility. August-May (semesters) Commencement and conferring of degrees: May Two summer semesters.